Black gold, devil’s tar, earth oil, flowing gold, fossil oil, rock oil–these were all terms for what we now call petroleum or crude oil that were used in the early part of the 20th century. Ohio led the nation in oil production for several years around the turn of the century and Mercer County helped make that possible. 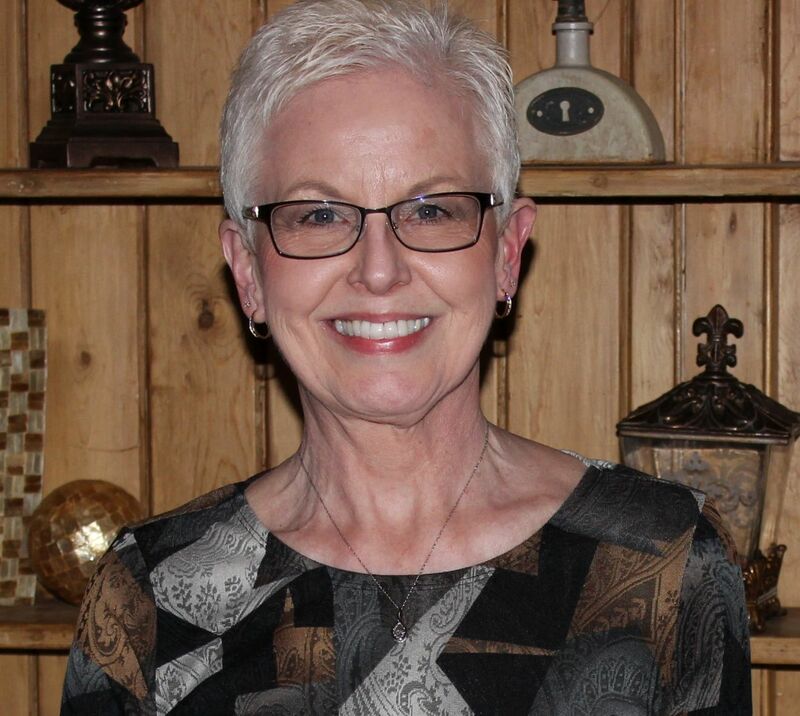 There is oil beneath the ground in Black Creek Township, in the surrounding Chattanooga area and in neighboring Indiana. 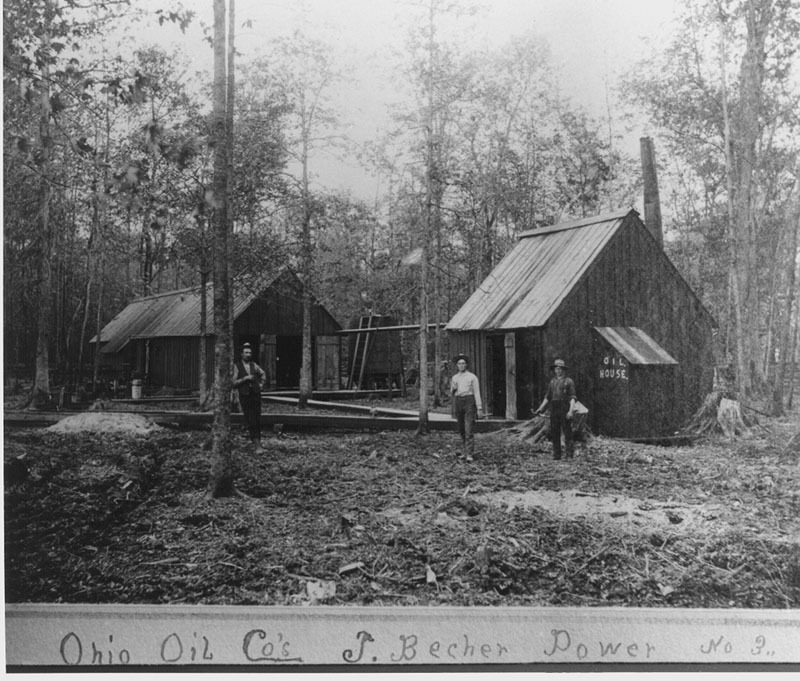 In fact, my great-grandfather, Jacob Miller, had seven working oil wells on his Black Creek Township farm in the early 1900s. Ohio has a rich history of oil and gas production that began over 150 years ago. The first discovery of oil from a drilled well was in Ohio in 1814, when a saltwater well driller discovered oil at a depth of 475 feet in Noble County. The first well drilled in the state was in Trumbull County in late 1859. 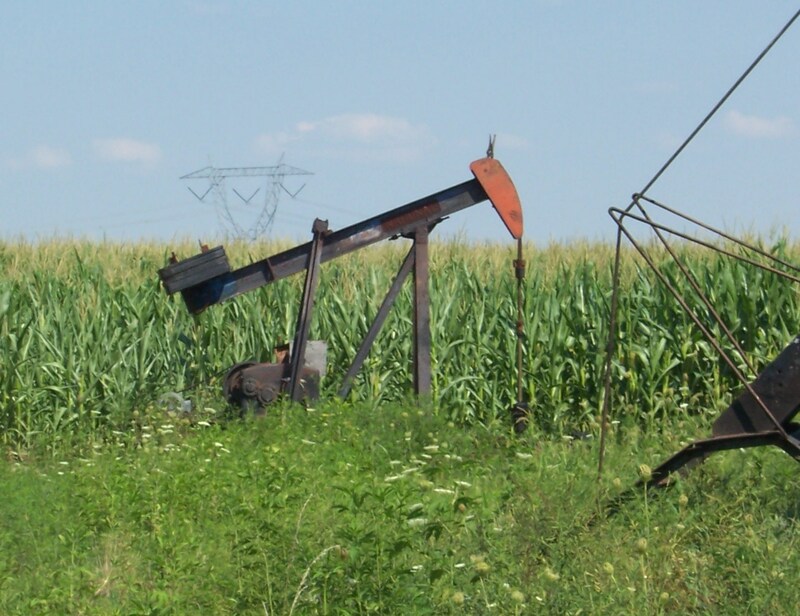 Oil and gas were discovered in Findlay, in northwestern Ohio, in 1884. It was found in Trenton Limestone at a depth of 1092 feet. That started a 20-year oil and gas boom. 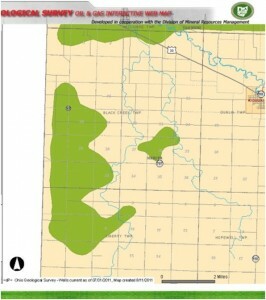 The Lima-Indiana oil and gas fields extend in an arc across Lucas, Wood, Hancock, Allen and Van Wert Counties and into northeastern Indiana. In 1896, 6,456 wells were drilled in Ohio and more than 23 million barrels of oil were produced, making Ohio the leading oil producing state in the nation from 1895-1903. John D. Rockefeller became involved in the oil business at this time through ownership of oil and gas reserves. Oil and gas were produced from more than 30 individual geologic formations, primarily of limestone, dolomite, shale, and sandstone. Depths range from 50 feet to as deep as 9,100 feet. Oil and gas are generally believed to have formed through geochemical alteration of decayed organic remains of plant life and marine organisms that have been deeply buried and subjected to high temperatures and pressures. Wells could be shot as soon as they were drilled. 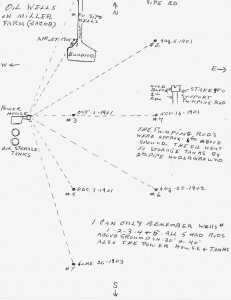 The method of “shooting” a well began by lowering a torpedo (a long cylinder) into the well and very carefully filling it with liquid nitroglycerin. Water was poured into the well to keep the explosion force downward and outward. To detonate the nitroglycerin a squib with a stick of dynamite or something called a “go-devil” (a heavy piece of metal shaped like a cross) was dropped into the well and exploded the nitroglycerin on impact. The go-devil got its name because the person wanted to “go like the devil” once it was dropped in the well. Koch well, north of Chattanooga, Ohio. Ohio Oil Company. A device called a pumpjack brought the oil up from below the ground. On the Miller farm all the pumpjacks were driven by a powerhouse which was located on the west part of the farm. The powerhouse consisted of a large iron turntable with rod-lines that ran to and powered the wells. My dad and my uncles talk about riding back and forth on the turntable when they were kids. The oil from the wells was stored in several large oil tanks at the powerhouse. From there the oil drained into a pipe that ran eastward under the ground and drained into another pipe at State Route 49. The oil went through this pipeline and eventually ended up in Lima. The pumpjacks on the Miller farm were taken down before I was born, but I remember seeing a pumpjack on the Caffee farm when I was a child. The Caffee farm was just west of the Miller farm and their last pumpjack was taken down about 1964. There is still a pumpjack and several large oil containers across the state line in Indiana, about 4 miles southwest of the farm. I took the above photo of that pumpjack a few days ago. It was not running at the time. Well #1: Started 11 April 1901, completed 27 April 1901; depth of 1196 feet; produced 40 barrels/first 24 hours. Well #2: Started 23 July 1901, completed 5 August 1901; depth 1188 feet; 23 barrels/first 24 hrs. Well #3: Started 13 Sep 1901, completed 1 Oct 1901; depth 1196 feet; 87 barrels/first 24 hrs. Well #4: Started 21 Oct 1901, completed 16 Nov 1901; depth 1173 feet; production not given. Well #5: Started 22 Nov 1901, completed 7 Dec 1901; depth 1202 feet; 30 barrels/ first 24 hrs, 20/second 24 hrs. Well #6: Started 11 Aug 1902, completed 28 Aug 1902; depth 1234 feet; 40 barrels/first 24 hrs. Well #7: Started 16 June 1903, completed 26 June 1903; depth 1145 feet; 30 barrels/first 24 hrs, 20/second 24 hrs. Location of Jacob Miller oil wells on 80 acre Black Creek farm. Thanks to my dad for drawing this map. 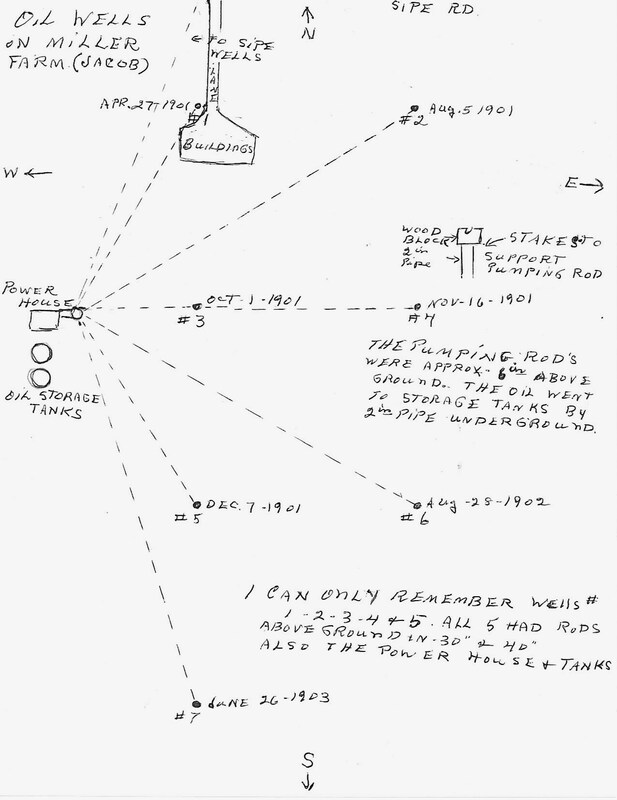 The torpedoes used to shoot the Miller wells contained from 160-200 quarts of nitroglycerin. That really sounds like a lot of explosives! What a dangerous job that would be to bring in and detonate that amount of explosives. My dad said they brought the nitroglycerin in by wagon and it was hung from the top frame of the wagon. This method worked like a shock absorber so the ride would not be so rough and set off the explosives. May dad has some papers that accompanied oil checks sent to Jacob Miller. They were from Oil City, Pennsylvania, and it is interesting to note the price of oil in the early 1900s. On 30 October 1908 Jacob received a check for $22.03 for 22.25 barrels of oil at $.99/barrel. On 16 Aug 1909 Jacob received a check for $12.12 for 14.96 barrels of oil at $.81/barrel. 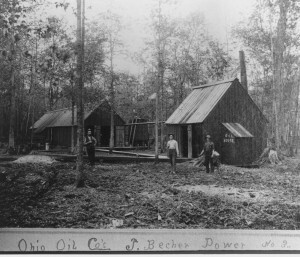 The oil wells on Jacob Miller’s farm produced oil until some time in the 1940s. Well #4 was the last working well on the farm. I grew up on what used to be called Wildcat Corner. It was once the location of Wildcat School, a one-room school house a mile north of Chattanooga. The school was used in the early part of the 1900s. I have heard that the school got its name from the many oil wildcatters in the area at that time. My aunt Ruth went to Wildcat School. Wildcatters from the Ohio Oil Co., a mile north of Chattanooga, Ohio. Gusher: Aka “flowing well”, named because natural gas under the oil was released when the exploring drill struck the pocket. 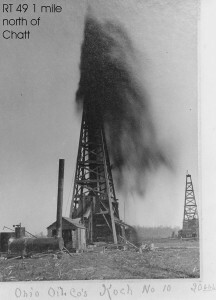 The gas rushed to the surface, carrying the petroleum ahead of it, causing it to flow spontaneously, often throwing it high in the air over the derrick and into the sky. Shooter: One who shoots oil wells with nitroglycerin to loosen or shatter the sand and to increase the flow of an oil well. Dead-in-a-Hurry: A worker who transports nitroglycerin. The name comes from the dangerous nature of the occupation. Many men lost their lives in this profession, and because of the danger were not allowed to carry life insurance, thus leaving their families in dire straits. 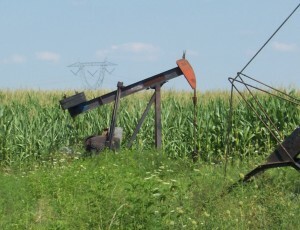 Pumpjack: aka nodding donkey, pumping unit, horsehead pump, beam pump, sucker rod pump (SRP), grasshopper pump, thirsty bird, jack pump, is the overground drive for a reciprocating piston pump in an oil well. It is used to mechanically lift liquid out of the well if there is not enough bottom hole pressure for the liquid to flow all the way to the surface. Derrick: A lifting device composed of one tower or guyed mast. Wildcatter: One who drills for oil in unproven territory in the hopes of striking it rich. Ohio remains a leading producer of oil and gas, ranking in the top half of all oil producing states in the nation. Commercial quantities of oil and gas have been found in 76 of Ohio’s 88 counties. More than 275,000 productive oil and gas wells have been drilled in Ohio and 64,378 are still in operation, most in the eastern third of the state. Most of Ohio’s production wells are referred to as “stripper” wells, which means that they produce less than 10 barrels of oil per day. Ohio ranks 4th nationally behind Texas, Oklahoma and Pennsylvania in the number of wells drilled. In 2010 Ohio wells produced more than 4.78 million barrels of oil and more than 78 billion cubic feet of natural gas. Market value for oil and gas production totaled nearly $718 million dollars.